Our last post introduced the Showy Cable, an exciting new way to use the Showy Decrease to knit a faux cable. One of my favorite things about the Showy Decrease is its versatility. There’s a list in the last post about all the different ways that we’ve used it. Here I’m thinking more about just how different the various applications look; some are geometric and angular and some soft and pretty. All the upcoming Showy Cable patterns are named after cities in Ireland starting with old Dublin. You can’t tell by my married name, but I’m Irish on both sides and it’s one of my favorite places to visit. I especially found the Aran Islands inspiring in a number of ways; the scenery, the language (they still speak Irish there), the stone walls and, of course, the sweaters. The shape is the same as the Caliente Shell from a few years ago. It’s both flattering and practical since you can wear a bra with it. The nautically inspired knotted straps also seemed perfect for the sea-faring nation. I like trying variations of the same concept and did so here. I knit the teal sample shown above the same up to the armholes but plan on finishing it with short sleeves. I’ll update the pattern with that option when I’m done. I’m in Tahoe without a model right now so I’ll add a photo of the Caliente Shell to the right so you can see how it fits. 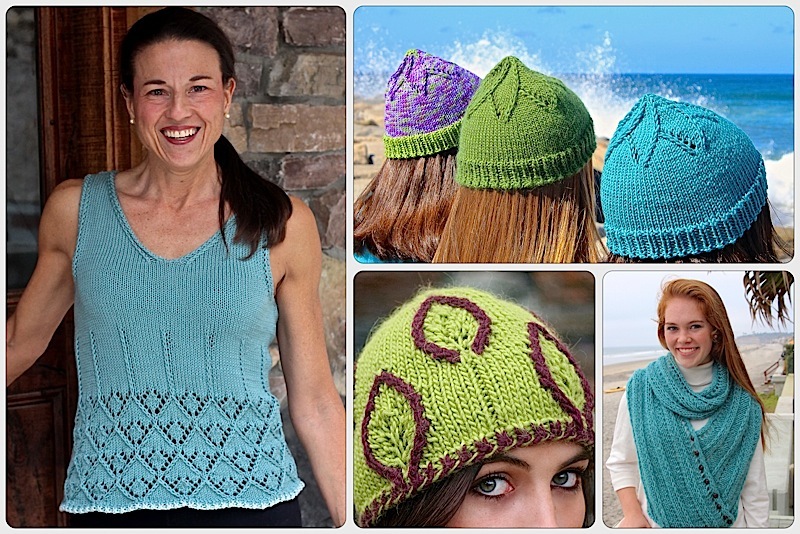 The Caliente pattern is free on Ravelry when you buy the Dubhlinn Summer Shell for $4.50. Code = Nuances Shells. None of my designs or techniques are difficult. The goal, especially at this point, is to introduce new ideas to enhance your knitting with techniques you can apply to other projects. We’ll add more complex versions as time goes on. However, I do pay lots of attention to small details that make a difference. You’ll almost never just cast on and go with one of my patterns. Decorative cast ons and bind offs take a little more time but are worth the effort. The Dubhlinn Summer Shell pattern uses 5 increases. They are yarn over, make 1 loop, lifted make 1 right, lifted make 1 left and knit 1 back & front (not front & back). The yarn over is used to create the eyelets in the faux cables but the other 4 are not meant show. Which increase is used generally depends on what’s going on in the stitches next to it. Other details include the unassuming but flexible alternating long-tail cast on and a 4 stitch i-cord bind off (with a ssk decrease) that allows you to insert a thin elastic cord to fine tune the fit. This blog post also helps with sizing the bind off. I broke the blog posts on this design into segments while I finished up the pattern. This post about the Flat i-Cord introduced the idea to a lot of our new readers. It had been awhile since we’d blogged about it and added our Mega Flat i-Cord Tutorial to Ravelry which includes this 5-part braided scarf. OK, I’m off to work on the next pattern, if only I could decide what it was. I’ve got several lined up but do I add another Showy Cable, go back to Showy Garter or share the pretty shrug I knit for my daughter that’s perfect for late summer? I need more hours. This entry was posted on August 7, 2017 by Laura Cunitz in Nuances, Patterns, Showy Cable, Tops and tagged Knitting Patterns, Showy Cable Rib, Showy Decrease.